Tata Motors is gearing up for the launch of its upcoming SUV Harrier. All preparations are in full swing and media drive reviews will be out on December 7th. A lot of information has been shared with media houses about the Harrier`s transmission, engine, dimensions and also the number of variants which will be on offer. Tata`s flagship SUV will be launching in January 2019 and the Harrier will be available in four variants namely – XE, XM, XT, and XZ. Tata Harrier XE – The XE variant is the base variant and will be equipped with ABS with EBD, dual airbags, speed sensitive door locks, parking sensors, central locking, seat belt reminder, projector headlights, LED DRLs, LED taillamps, power adjustable wing mirrors, 4 inch MID, manual AC, 16 inch steel wheels, power adjustable wing mirrors, Four-way adjustable driver’s seat, Puddle lamps, Tilt and telescopic adjustable steering wheel and rear AC vents. Tata Harrier XM – The XM variant sits above the XE variant and will get the following features – Front fog lamps, Rear parcel shelf, 7.0-inch infotainment touchscreen with four speakers and two tweeters, USB, Aux and Bluetooth compatible audio system, Multi Drive modes for the engine (Eco, City and Sport), Steering-mounted audio controls Remote central locking, Six-way adjustable driver’s seat, Boot lamp, Rear wiper, and Follow me headlamps. Tata Harrier XT – The XT variant gets some more additional features like 17-inch alloy wheels, Dual function LED DRLs Audio system with four speakers, Voice recognition and SMS readout, Video playback and image display via USB Android Auto, Reverse camera, Video playback and image display via USB Push-button start, Climate control system, 8-way adjustable driver’s seat, Power folding and adjustable wing mirrors, Cruise control, Automatic headlamps and wipers, Cooled storage under the front center armrest, and rear armrest with cup holders. 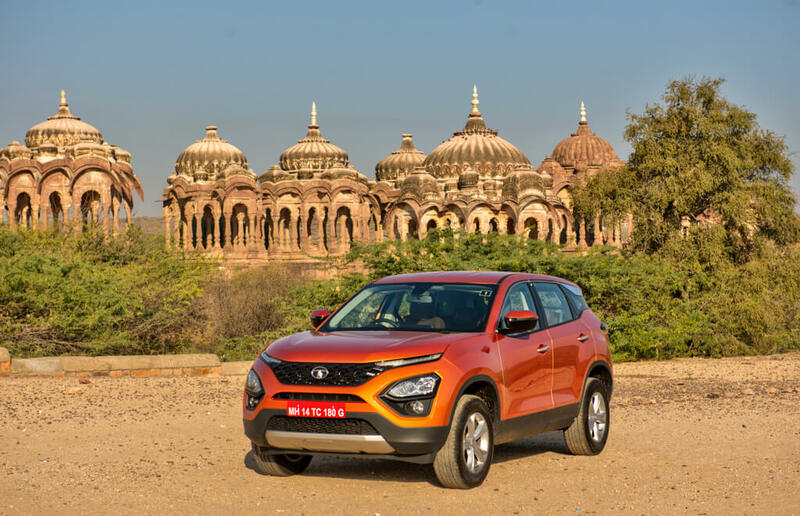 Tata Harrier XZ – The XZ trim is the top of the line variant which gets all the bells and whistles. Key features include – Front fog lamps with cornering function, Shark fin antenna, Leather seats, Xenon HID projector headlamps door panels, Nine JBL speaker system, 7.0-inch digital instrument display, 8.8-inch touchscreen infotainment system, Six airbags (Driver, Co-Driver, Seat Side & Curtain), ESP Isofix child seat mounts, Hill-hold and hill-descent control, Terrain response modes (Normal, Wet and Rough), Roll-over mitigation, Corner stability control, Hydraulic brake assist, Traction control, and 60:40 split folding seats.